Last week I shared a list of a few photography educational products that I felt were good for beginner photographers. In this second part of my recommended resources I have some more advanced and intermediate products for you if you are at a higher level than just starting out. 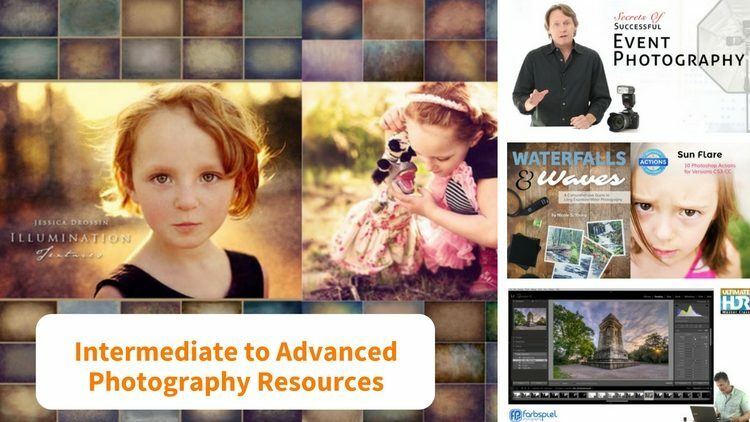 As with the beginner photographer resources, I have handed picked out of the bundle for you are from instructors that I know based on my past experience, have high-quality products. They are good instructors, with good educational products you can learn from and improve your photography. Waterfalls & Waves is, as stated on the cover image, a comprehensive guide to long exposure photography aimed at intermediate to advanced photographers. If that's you and you like to photograph waterfalls and the ocean, this is the book for you. It comes with an ebook (133 pages), four Lightroom presets, and five video tutorials that walk you through how she has processed different images using Lightroom, and ON1 software plugins. She also provides the five raw files for those images so you can follow along step by step. Advanced tips and tricks about color casts from filters, shooting at sunrise or sunset, shooting from bridges, dealing with moisture on lenses and filters and more. If you participated in the Long Exposure Monthly Challenge we did a while back and were not 100% happy with your results, this guide could help you out. If you enjoyed the article: 12 Tips for Photographing Your Own Kids – the World's Toughest Models that Jessica did for us here a while back and want your photos to have a similar style – then this is the pack for you. Inside you get over 100 texture overlays and her Instant Overlay Photoshop action. You do need Photoshop or a program that works with layers to utilize textures. You can see a tutorial on that here: How to Give Your Pictures an Authentic Vintage Appearance. Try it out and if you like that style you can give these a go. I just love her style and think her portraits have a timeless and ethereal quality about them. I took one of my images and played with a few of her texture overlays. I found several that worked nicely on this image and each gives it a different feel. Lindsay Adler is not someone I've worked with in the past but I've seen her on Creative Live and she's a great teacher. I think this would make a really nice complement to our own Portrait Lighting Fundamentals course. So if you already own that one, have a look at this to take your portraits to the next level. Posing is one of the hardest things to get right. Trying to direct another human being into a pose is challenging. In the Posing Pitfalls Checklist Lindsay covers five common posing issues and how to solve them. In the Creative Studio Lighting Guide you get recipes for 30 different studio lighting setups and looks. You see behind the scenes set up, a diagram to show you where to place the lights, camera gear and settings information and step by step instructions on how to duplicate it. You also get a one hour video about posing. Lindsay demonstrates for you and talks about things like how to direct your subject, getting them to move their head, etc. without touching them. Watch how a pro works with models and adapt the information to fit your own style. Many people consider Trey Ratcliff as the guy who made HDR photography popular several years ago. I believe it is Klaus who took it to the next level and perfected it! This is a seriously intensive and all-inclusive course on doing HDR photography. The 13 hour video course covers everything from gear, shooting preparations, and camera settings (including tips like how to handle white balance and focus), and bracketing using both Auto Exposure Bracketing and doing it manually. Klaus takes you into the field and shows you how he shoots his brackets, so you can make sure you get enough shots to process your HDR later. He also covers advanced issues like dealing with noise in your images, de-ghosting (caused by things which moved from one frame to the next), and making HDR panorama and vertorama images, which is what Klaus is well-known for. So if you want a full walk-through of how to do HDR photography from one of the best – this is it! Phil is one of the top photography educators in the industry right now. I've worked with him on a project in the past and often share his videos on dPS and I can tell you he's always professional and is a great teacher. I have the utmost respect for him. This course is for anyone that wants to photograph events, even if it's your kid's birthday party or your next family reunion! You do not need to be a pro, or even want to be one, to get good value from the lessons inside Secrets of Successful Event Photography. I could tell you about the 25 lessons and over 5 hours of videos you with it – but I think what you really want to know is, “What can this course do for me and my photography?” In a nutshell, it will help you feel more confident shooting any event, learn the skills you need to back that up and be ready to take on any that come your way. Never again will you feel you just aren't good enough to tackle events. Two teachers on this one! Phil and his co-instructor Julie cover everything you need to get started, what gear to use, what camera settings will help you get the best images. Then they walk you through various different scenarios and situations you might face shooting events and help you answer all your questions before you get into trouble on location. One of the biggest issues I see beginners, and even more experienced photographers struggle with, is using flash. Getting it to look more natural and not “over-flashed”, off-camera flash, flash exposure compensation, when and how to bounce your flash (if you learn this you're half way there! ), and more is all covered. So if you've ever been frustrated with your images from personal events, had blurry shots or ones that look like amateur snapshots with harsh flash, or you're too nervous to even attempt photographing an event – watch this online photography course!